Busy Thimble: Long Time Gone...................Again! I've owned my quilt shop since 1990, specializing in antique reproduction fabrics. Made my first quilt in 1976 which greatly reduced my sewing of clothing! Would like to find more time to SEW.......maybe when I retire? Am married to a farmer, have 3 children and 4 grandchildren who are the light of my life!!! And now there are 3 great-grandchildren and another due in January 2019! Winter has been long and boring......seemed colder than usual.....glad it is nearly over! Jen Kingwell's "Long Time Gone" pattern name seems to fit me to a T! I have done a little work on her sampler pattern but ambition seems to have left me this winter.....spent more time reading than sewing! Felt good to sit in that rocking chair beside the woodstove! This is the upper left corner HST unit and 3 paper-pieced Pineapple blocks. The dark beige sashing is my second choice, having already removed a lighter one. NOW, this tiny little print (seen at far right) shows up and I really don't want to remove/replace again (tho it is only two pieces!). I really like the plain sashing as I think it defines the block areas whereas the print sort of blends, But everyone else seems to like the print better! Really like working on LTG as it is just done in small bits at a time. I have a triangle row ready and the next section is "Jacob's Ladder" which I am going to change to look more like real JL blocks! Found some antique ones on eBay that I am using for inspiration. eBay blocks are "about" 8"......mine will need to be either sixteen 3" or four 6" to fit the allotted 12" space. That's a decision for another day! Yesterday I finally had some sewing time (have been taking Wed off this winter for some sewing time and yesterday was the First Wed that something else did not take precedence!!!) After spending time thinking about Which Project to work on (too numerous to count! ), I decided to make the first row from Pam Buda's Circa 1880 club. The background is Aged Muslin by Marcus and until I washed it, it felt too stiff to work with. But, once washed, it softened up.....the weave is fine and tight and I liked sewing with it. 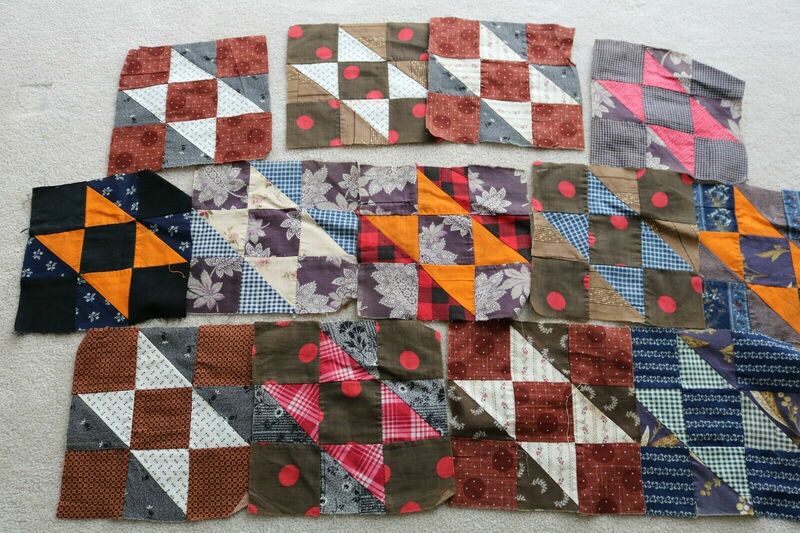 Since I swapped blocks with 3 other ladies, I have enough to make a good start and will only need about 150 more. These blocks are absolutely precious and finish at 2". The log cabin blocks above are my most current project and is getting most of my attention this winter. About to start the fourth round of light, I decided I needed more (that is Different) fabrics so spent time taking 6-1/2" strips off a stack of light fabrics so I could make 1" strips and 1-1/2" strips which are what I seem to use the most. Have more fabrics to cut strips from but will wait until I am ready for the fifth and final round. The blocks finish at 6" and I love them! Made a wallhanging using 16 blocks that I just Loved after I hand-quilted each log! Now I want one for my bed! Another LTP (Long Term Project as Jeana Kimball calls it!) Have Lots of those! 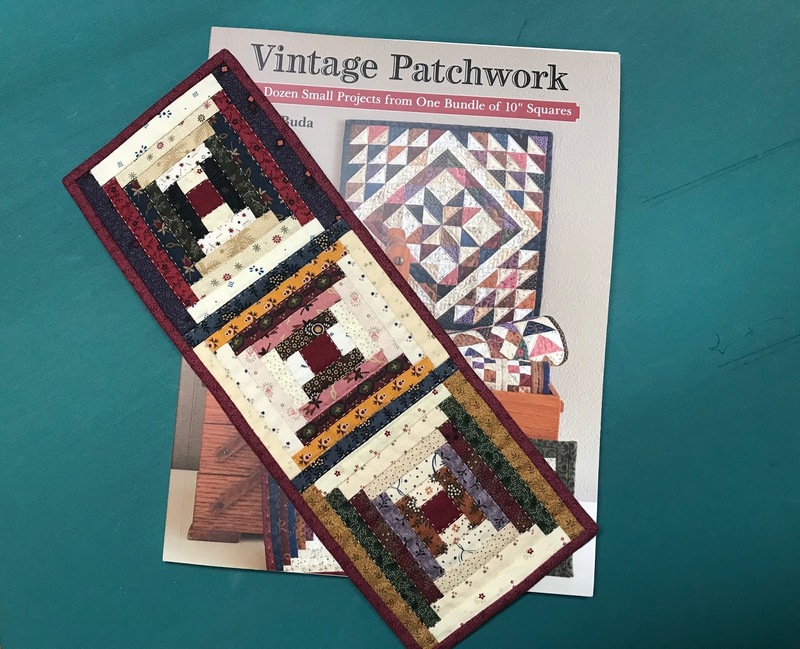 I made this tiny (4" x 12") log cabin runner from Pam Buda's "Vintage Patchwork" book.....spent way more time on it than you'd think for a tiny project, but I had to handquilt it because I love the feel of handquilted everything! From Pam Buda, her Circa 1880 line.....more coming later. The above fabrics are "Porcelain" by 3 Sisters for Moda. Seemed fitting for spring......would like to make a Medallion quilt using light colors such as these! Love this "Bed of Roses" by Edyta Sitar! More choices for a light Medallion! Love these "Yarra Valley" stripes from Max and Louise....especially the green! Reminds me of the Centennial Green Wendy and I saw in 1870's log cabin quilts during quilt documentation days......seemed so wrong for the time period but we soon learned it was right! French General solids......true colors are light blue, red and darker blue. Camera did not see them in the right light! "Vive Le France" by French General......love her reds! Great-grandson Baylor, age 3, sliding down the snowbank in the front yard. We found the old toboggan in the woodshed and it fits him perfectly! This was intended to be a short post and it just kept growing as I thought of things! I'll leave you with this photo of an old, wonky Pineapple quilt! Before Christmas, I decided I'd looked at the quilt that had been hanging on the wall for years (sun never touches it)! This was the first quilt I could lay my hands on......its imperfection is rather charming (tho we would never stand to do it ourselves, would we?) and it is a great selection of fabrics to study! Hi Cyndi, I'm glad to see a post from you, I was beginning to worry. I like the solid sashing better in your LTG quilt. Having recently seen several of them I can say that LTG is a very busy pattern and a solid sash helps gives that quilt design some quiet space. can't blame you for sitting by the stove! lovely new fabrics esp the french general prints...oh la la! I love your LTG in repros - beautiful fabrics make a good pattern better :0) Love the Pineapple quilt too! I made Long Time Gone in repros, too! I just love it. Can’t wait to see yours. Hope you show us progress shots! So beautiful blocks and projects,hard to choose only one best fav,love your fabric combo and the new fabric are yummiest ! A LQS had a LTG quilt in CW repros hanging on their wall last year. I had to buy the pattern, but I haven't started it. I applaud you for adapting it to your personal taste. 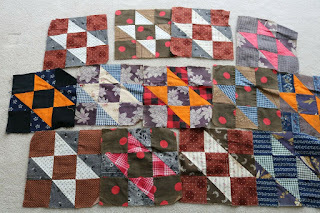 It is exciting to see those little Circa 1880 blocks start to become a quilt! Love both of the LC projects. You have some lovely fabrics coming in. So much temptation! You have so many lovely projects you are working on!! I'm a fan of the latest FG line! !